While accessibility has been a concern for K-12 online learning since the field’s beginning, in the past few years, legal actions have been taken toward K-12 online schools and programs when they have not put meeting the needs of students with disabilities at the forefront of the design of their digital learning opportunities and services. There has been and continues to be a growing concern that students with disabilities, who are often seen as an at-risk population, are not being served by digital learning programs, especially considering a substantial portion of the digital content and tools available to K–12 students and schools today does not meet legal requirements to provide equal access for all students. At the federal legislative level, three laws govern accessibility in digital education. In 1973, Section 504 of the Vocational Rehabilitation Act, enforced by the U.S. Department of Education’s Office of Civil Rights (OCR) was passed to protect the rights of individuals with disabilities in programs and activities that receive federal financial assistance, including funds from the U.S. Department of Education. Since Section 504’s inception, amendments have been added, including Section 508, a 1998 amendment which specifically addresses electronic and information technology accessibility for people with disabilities generally, with implications for technologies being used in education. This was the first time that standards were set for how digital education should be designed with accessibility in mind. In addition to Sections 504 and 508, the 2004 Individuals with Disabilities Education Act (IDEA) governs how states and public agencies provide early intervention, special education and related services to students with disabilities. Age ranges covered by IDEA include age 3 to age 18 or 21 in some cases. Whether or not a student falls under IDEA protection depends on their alignment with one or more of 14 specified categories of disability, including autism, deaf-blindness, deafness, developmental delay, emotional disturbance, hearing impairment, intellectual disability, multiple disabilities, orthopedic impairment, other health impairment, specific learning disability, speech or language impairment, traumatic brain injury, and visual impairment, including blindness. While the above laws were a step in the right direction, the field was looking for more practical guidance as to how to follow the laws’ guidelines and needed to have a clear understanding of how to design online learning experiences and courses with students with disabilities in mind. An international group called the World Wide Web Consortium was founded by Web inventor Tim Berners-Lee. This group’s mission is to bring the Web to its full potential. In 1997, with the endorsement of The White House and W3C members, the Web Accessibility Initiative was created to develop clear web design standards to help guide and support online course developers. These standards were called the Web Content Accessibility Guidelines (WCAG) 2.0. WCAG 2.0 provided a more comprehensive set of specifications as compared to the ones included in the 508 legislation. All of these laws and guidelines are founded on the premise that instruction that is provided in an online format must meet the needs of students with disabilities, allowing them to gain the same information and engage in the same interactions as students without disabilities. 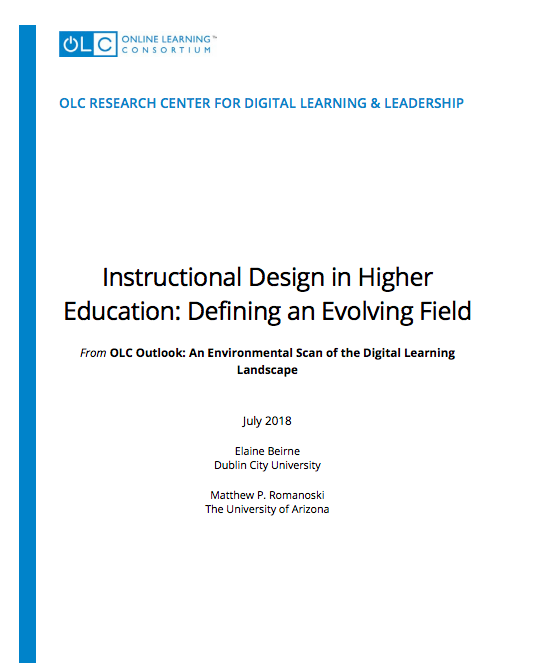 Compared to accommodations in a traditional classroom setting where there tends to be more non-digital instruction, the consequences are more direct for online courses and programs. For groups like the California Learning Resource Network and Quality Matters, their number one concern when reviewing courses for K-12 online and blended programs is that the courses do not address accessibility issues. Based on these concerns, the Center on Online Learning and Students with Disabilities was created out of grant funding from the U.S. Office of Special Education Programs. The team of researchers and educators included University of Kansas faculty from the Center for Research on Learning, Center for Applied Special Technology (CAST), and the National Association of State Directors of Special Education (NASDSE). Lasting five years (2012-2017), this Center helped to provide a research base about what the landscape looks like at the intersection of K-12 online learning and students with disabilities. What the Center found was dismal, reporting in 2012 what it called “significant concerns” about accessibility. Included in these concerns are inconsistent policies from state to state and district to district when it comes to funding, policies, and roles and responsibilities when focusing on serving students with disabilities in online learning environments. Additionally, there was a concern about accessibility from course to course as well as the lack of basic instructional design knowledge, specifically of Universal Design for Learning (UDL). And finally, the Center had a call to action for teacher preparation programs to not only prepare teachers to teach online but also to provide teachers guidance on how to better meet the needs of the students with disabilities in online courses. As the report mentions, preparation for regular education teachers has minimal requirements for training specific to working with students with disabilities. All digital images must have alternative text (alt text) so that screen readers can describe the image to visually-impaired students. Videos must be closed-captioned and/or include transcripts so that students with auditory listening or processing issues can access the information. Screens with lengthy amounts of text should have an audio file of the text included at the bottom for students who need it. Course builders need to be aware of when to build information that can be accessed in the browser and when information needs to be downloaded. Text in a browser can easily be summarized, highlighted, and translated using free web tools. Not all of these tasks can be accomplished with downloadable text. English language learners need text that can easily be converted to a native language. Poor video quality and flashy animations should be minimized or eliminated for students with attention deficit issues. Tasks should be broken into manageable chunks. All longer activities should have progress indicators for students with anxiety issues. Scanned materials must have Optical Character Recognition-readable text. Course materials that need to be converted to Braille should be delivered in advance to students who are doing their own converting so that they have it converted and ready to use when needed. Students with extended time on exams need to be grouped separately and discreetly so that they have the time allowed for exams. Information that is presented in lockdown browsers should be checked to ensure that it is accessible by assistive technology. The list above is illustrative and not comprehensive. Some additional resources from various organizations are provided to the right, for further guidance. The Center on Online Learning and Students with Disabilities has a plethora of resources on their website regarding meeting the needs of students with disabilities in online learning environments. TxVSN – The Texas Virtual School Network has published detailed accessibility guidelines and checklists. iNACOL – The International Association for K-12 Online and Blended Learning addresses accessibility in its National Standards for Quality Online Courses . QM – Quality Matters has a course review rubric that can be used by educators who are designing online courses. UNESCO – The United Nations Educational, Scientific, and Cultural Organization has at least three reports focused on the importance of meeting the needs of students with disabilities in digital learning environments, including Accessible ICTs and Personalized Learning for Students with Disabilities: A Dialogue Among Educators, Industry, Government, and Civil Society (2011); Learning for All: Guidelines on the Inclusion of Learners with Disabilities in Open and Distance Learning; and The Right to Education for Persons with Disabilities.